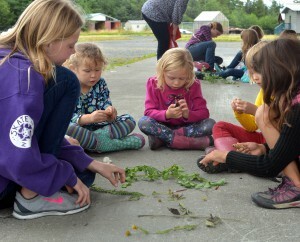 Girl Scouts of Alaska came to Petersburg last week to hold a weeklong day camp. Girls ages kindergarten through junior high participated in the events, many of which happened outdoors. A few dozen girls are in a circle outside the Rae Stedman Elementary School. They’re singing songs and dancing around on top of the gray gravel near the playground. The Girl Scouts traveling camp goes to a new remote Alaska community every week. In Petersburg, the girls have been meeting every day learning social and educational skills. Now, they are being led through sing-along songs by a few Girl Scout leaders, such as Josie Ward. She’s a college student in Missouri, but is spending part of her summer in Alaska helping run the camps. The weeklong camp has a $40 suggested donation but they will give any girl a scholarship who can’t pay. The traveling camp has been going for nine weeks already. Girl Scouts has already held camps in Ketchikan in Southeast. The week of Aug. 8-12 camps will be in Sitka.